As winter gives way to spring in the martian southern hemisphere, the Mars Global Surveyor (MGS) Mars Orbiter Camera (MOC) is observing the retreat of the south polar frost cap as sunlight falls upon it for the first time in several months. One of the most aesthetically-pleasing aspects of the spring defrosting process is the pattern that is created on the martian sand dune fields. Dunes are usually among the first surfaces to begin showing signs of change in late winter when temperatures are just beginning to creep above -125° C (-193° F; 148 K). The pattern of spots on the dunes in the above MOC picture was observed on June 8, 2001. The location of the dune field near 62°S, 155°W, is shown in the color context view, which was acquired at the same time. Dark spots and streaks on defrosting sand dunes were first observed by MOC in the northern hemisphere in 1998. Similar dark-spotted dunes in the southern hemisphere were described at a NASA/Mars Global Surveyor Space Science Update media briefing in 1999. Despite the "sensation" one gets when looking at pictures of spotted, defrosting martian dunes (i.e., the sensation that these images show some form of life, like vegetation, growing on Mars) these features are a normal, common manifestation of the springtime defrosting process on Mars. The ices involved--because of the low temperatures at these locations--are probably both frozen water and carbon dioxide, though it is unclear as to whether one type of ice dominates over the other in controlling the appearance and coalescence of the dark spots. It is known from the first martian year of MOC operations that by summer all of the frost--and thus all of the spots--on the dunes will be gone. North is up and sunlight illuminates the scene from the upper left in both pictures. The color context view covers an area approximately 115 km (72 miles) across; the high resolution image covers 3 km by 22 km (1.9 by 13.6 mi). 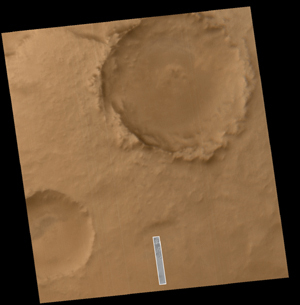 Supulver, K. D., K. S. Edgett, and M. C. Malin, Seasonal changes in frost cover in the martian south polar region: Mars Global Surveyor MOC and TES monitoring of the Richardson Crater dune field, Lunar and Planetary Science XXXII, Abstract No. 1966, Lunar and Planetary Institute, Houston, Texas, March 2001. Edgett, K. S., K. D. Supulver, and M. C. Malin, Spring defrosting of martian polar regions: Mars Global Surveyor MOC and TES monitoring of the Richardson Crater dune field, 1999-2000, The Second International Conference on Mars Polar Science and Exploration, Abstract No. 4041, Reykjavik, Iceland, August 2000. Malin, M. C., and K. S. Edgett, Frosting and defrosting of martian polar dunes, Lunar Planet. Sci. XXXI, Abstract No. 1056, Lunar and Planetary Institute, Houston, Texas, March 2000.